Agenda: Final meeting of the semester. Show: Due to it being Nate's final meetings he chose an non-anime movie showing. Agenda: Only one meeting left this semester! Nate has declared his final meeting as president to be a game night, bring any type of game you wish! Overview (Official Description): Feudal Japan: a time of danger, intrigue and deception. 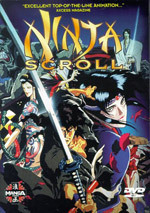 After an entire village is decimated by a mysterious plague, a master swordsman named Jubei undertakes a desperate quest to find The Shogun of the Dark - an evil autocrat who plans to overthrow Japan's Tokugawa government. 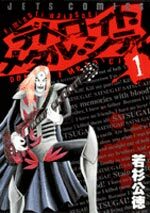 But in order to capture him, Jubei must face The Eight Devils of Kimon: the Shogun's fearsome force of demonic henchmen, each possessing awesome superhuman powers. Joined on his journey by the beautiful and deadly female ninja Kagero, they must together defeat the dominion that rule in terror and restore order to the land. Agenda: Only two meetings left this semester. Discussed final meeting plans. Agenda: See you at Zenkaikon this weekend! Impromptu new season sample night. Overview (Official Description): On the internet, they're legends: the tag-team duo known as BLANK, famed for their incredible game-playing skills. In the real world, however, the lives of 18 year old Sora and his 11 year old stepsister Shiro have been spiraling out of control. Now existing as shut-ins, they rarely leave their house and are unable to be separated without suffering panic attacks. Games, for them, are the safest retreat from reality. Until they win a chess match against a mysterious opponent known as Tet and find themselves pulled into a game bigger than any they could have ever imagined. Now, in a world where the outcome of games determines the fates of both civilizations and species, they must defend Humanity in the ultimate challenge, vying against a host of otherworldly competitors for the right to rule them all! But if they fail, it means slavery or destruction for all mankind. No pressure, of course! Can two misfits who can barely handle their own lives somehow rise to the occasion and save the human race? 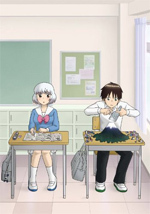 Overview (Description from Wikipedia): High schooler Yuki Hase notices that his classmate Kaori Fujimiya is always alone and seemingly has no friends. After approaching her and becoming acquainted, Kaori reveals that she loses every memory of her friends each Monday. Despite learning this, Yuki endeavors to become her new friend every week. Overview (Description from Wikipedia): Shintaro Kisaragi is an 18-year old hiki-NEET who has not left his room in two years, engrossing himself with his computer and the internet. 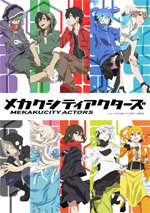 However, on August 15, due to the messing about of the cyber girl Ene, who lives inside his computer, Shintarō spills soda on his computer keyboard and is forced to go outside to buy a new one, due to the fact that during the Obon festival none of the stores will deliver until August 17. 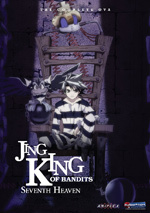 Shintaro goes to the department store, where a group of criminals break in and hold the people inside hostage for ransom. 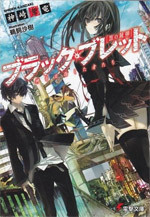 Here he comes in contact with a group of teenagers calling themselves the "Mekakushi Dan" ("Blindfold Gang"), who stop the robbery with their mysterious eye powers and force Shintaro into joining their group. Agenda: Congratulations to the new officers for Fall 2014-Spring 2015! President: Matt, Vice President: David, Secretary: Valerie, Treasurer: Ron. Held the anime auction, thanks to all who bid! 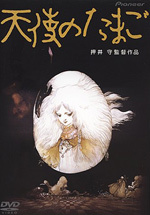 Overview (Description from Wikipedia): Angel's Egg follows the daily life of an unnamed young girl living in an seemingly abandoned, Gothic influenced city. She lives alone, and cares for a large egg which she carries with her under her dress as she explores the city and gathers water and food. She has a fondness for using clear glass globe bottles as drinking vessels and likes to spend long moments looking at pools of water. In a prologue, a soldier watches as an orb shaped vessel descends from above, carrying rows of Greek-influenced female statues with hands held in prayer, large egg shapes embedded in their collarbones and at their navels. Agenda: Officer Elections for the Fall 2014-Spring 2015 semesters will be on Thursday April 17th, 2014 along with the anime auction. Overview (Description from Wikipedia): The film chronicles the first encounter in combat between Reinhard von Müsel and Yang Wen-li. Agenda: On Friday April 11th, 2014 the club will be showing Akira at 8:00 p.m. in Centennial Hall Room 218. Officer Elections for the Fall 2014-Spring 2015 semesters will be on Thursday April 17th, 2014 along with the anime auction. Overview (Official Description): Tortured by his past and pained by an uncertain future, Tomoya drifts through life with an almost overwhelming anger and emptiness. 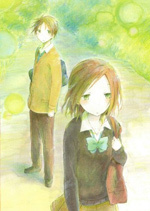 But when he meets the mysterious, beautiful, and shy Nagisa, his world seems to change. Drawn in by her gentle but lonely spirit, he begins to experience the joy life can bring. But as he discovers the reason for his newfound friend's loneliness, Tomoya also finds that life can be frighteningly fragile. Agenda: Club food potluck with Nate's Curry! Siblings' and Children's Weekend event was a success. Spring Fest banner competition has been abandoned due to a lack of time. On Friday April 11th, 2014 the club will be showing Akira at 8:00 p.m. in Centennial Hall Room 218. Officer Elections for the Fall 2014-Spring 2015 semesters will be on Thursday April 17th, 2014 along with the anime auction. Show: A large game of Anime Pictionary was played after the potluck. Agenda: The club food potluck will be held on Monday April 7th, 2014 at 7:30 p.m. Members are needed to help with the Siblings' and Children's Weekend booth. On Friday April 11th, 2014 the club will be showing Akira at 7:30 p.m. in Centennial Hall Room 218. Officer Elections for the Fall 2014-Spring 2015 semesters will be on Thursday April 17th, 2014 along with the anime auction. 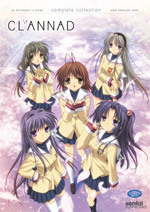 Overview (Description from Wikipedia): The basketball team of Teiko Middle School rose to distinction by demolishing all competition. The regulars of the team became known as the "Generation of Miracles". After graduating from middle school, these five stars went to different high schools with top basketball teams. However, a fact few know is that there was another player in the "Generation of Miracles": a phantom sixth man. This mysterious player is now a freshman at Seirin High, a new school with a powerful, if little-known, team. 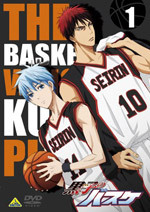 Now, Kuroko Tetsuya, the sixth member of the "Generation of Miracles", and Kagami Taiga, a naturally talented player who spent most of middle school in the US, are aiming to bring Seirin to the top of Japan, taking on Kuroko's former teammates one by one. Agenda: The club food potluck has been moved to Monday April 7th, 2014 at 7:30 p.m. due to weather. Discussed Spring Fest banner competition and Siblings' and Children's Weekend events. On Friday April 11th, 2014 the club will be showing Akira at 7:30 p.m. in Centennial Hall Room 218. Officer Elections for the Fall 2014-Spring 2015 semesters has been moved to Thursday April 17th, 2014. Overview (Official Description): Alibaba is a young carrier who dreams of gaining enough money to buy a whole country. To achieve this goal he must venture into a mysterious ruin called a "dungeon," which is said to hold secret treasures deep within its labyrinth. Unfortunately, Alibaba lacks the courage to carry out his plan and remains a worker. 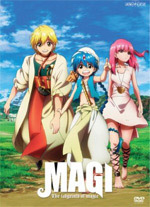 Until...One day, Alibaba meets a mysterious boy named Aladdin who can summon a mighty blue spirit from a flute and travels across the continent in search of Djinn Metal Vessels. Hoping to harness Aladdin's magical power, Alibaba invites Aladdin to join him on his dungeon-capturing expedition. Along the way and through numerous encounters and farewells, both of them will come to learn the truth about their destiny! Agenda: Discussed Jaycon. The club food potluck will be held on Monday March 31st, 2014 at 7:30 p.m. Discussed Spring Fest banner competition and Siblings' and Children's Weekend events. On Friday April 11th, 2014 the club will be showing Akira at 7:30 p.m. in Centennial Hall Room 218. Officer Elections for the Fall 2014-Spring 2015 semesters will be on Monday April 14th, 2014. Agenda: Discussed Spring Fest banner competition and Siblings' and Children's Weekend events. On Friday April 11th, 2014 the club will be showing Akira at 7:30 p.m. in Centennial Hall Room 218. The club food potluck will be held on Monday March 31st, 2014 at 7:30 p.m.
Show: Alternate Programming Night! Convention style panels "Name That Tune" and "You're Wrong and You Should Feel Bad" were presented! No meetings on Monday March 17th, 2014 & Thursday March 20th, 2014 during Spring Break. Meetings resume on Monday March 24th, 2014. Agenda: There will be no meetings on Monday March 17th, 2014 & Thursday March 20st, 2014 during Spring Break. Meetings resume on Monday March 24h, 2014. 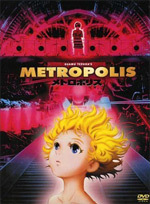 Discussed changes to movie showing, will be showing Akira. Homemade Pachinko game for Siblings' and Children's Weekend is moving forward. A used Anime auction will be held sometime later in the semester. A club food potluck will be held on Monday March 31st, 2014. Discussed the clubs entry into the Spring Fest banner competition. Alternate programming night will be on Monday March 24th, 2014 featuring two anime convention style panels. Overview (Official Description): Please visit links for full description. Agenda: Discussed changes to movie showing. Discussed creating a Pachinko game for Siblings' and Children's Weekend. Reviewed club viewing history. 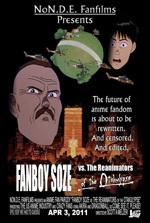 Overview (Official Description): In the not so distant future anime fandom is everywhere and everyone is an Otaku. But all is not well in this fanboy paradise! The corporate giant Megatainment controls all anime in the US and horribly butchers classic shows to make a buck. A small group of fans has had enough and tries to take down the evil monopoly. What can possibly go wrong? Agenda: Club budget for Fall 2014-Spring 2015 has been approved. Discussed Siblings' and Children's Weekend along with Bloomsburg Renaissance Fair. Overview (Official Description): Set in the future, Metropolis is a grand city-state populated by humans and robots, the cohabitants of a strictly segmented society. Amidst the chaos created by anti-robot factions, detective Shunsaku Ban and his sidekick Ken-ichi are searching for rebel scientist Dr. Laughton. 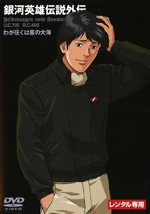 But when they locate him, his secret laboratory is destroyed by fire under sinister circumstances, and instead Ken-ichi finds Tima, a beautiful young girl bereft of memory and speech, seemingly helpless at the site. Little does he know that Tima is a new top-of the-line android created to take over Metropolis, and that behind her creation lie the ambitions of a powerful man and his fierce desire to reclaim a tragic figure from his past. Agenda: PR brochures are now available. Discussed a movie showing for early April. Overview (Official Description): Seventh Heaven is a hellhole of a prison that houses thousands of hardened criminals - plus one Bandit King and his feathered sidekick! Jing and Kir aren't locked up against their will, though; the infamous thieves have plans to relieve the convict conjurer Campari of something both valuable and mystical. But if Jing and Kir aren't careful, they'll find themselves going from behind bars to trapped in a bizarre world of illusion where there's much more than freedom at stake! Agenda: Continued discussions about current issues and possible options. Overview (Official Description): "Never lose that strength or nobility, even when you grow up." When Utena was just a child and in the depths of sorrow, she found salvation in those words. They were the words of a prince, who wrapped her in his rose-scented embrace and bestowed upon her both a ring and the promise that it would lead her to him again. She never forgot the encounter. In fact, she was so impressed that she aspired to be like the prince and also help those in need. 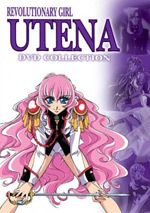 Now a spirited teenager, Utena attends the prestigious Ohtori Academy; however, her strong sense of chivalry soon places her at odds with the school's student council and thrusts her into a series of mysterious and dangerous duels against its members. Agenda: Discussed the future of the club and current issues including attendance and possible options. 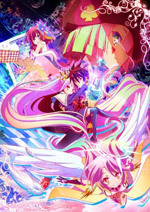 Overview (Official Description): On the outside, Punie-chan looks like your average magical girl. She's a cheery princess from another land, she's attending school on Earth for the year, and she has an adorable animal sidekick. But cross her and prepare to pay the price. The sweet young lady becomes a merciless force of destruction, leaving bodies, utterly broken by her signature submission holds, in her righteous wake. While it seems that she has more enemies than friends and that even her sidekick Paya-tan is out to get her, no one can deny that Punie-chan is irresistible in one shape or form. The Thursday February 13, 2014 meeting has been cancelled due to the closure of Bloomsburg University because of inclement weather. Agenda: Game Fest raised $60 for charity. Monday will be pot luck - Magical girl episode round. 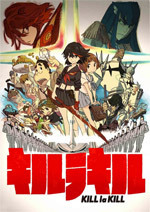 Sam, the winner of game tournament has chosen to show Kill la Kill. Overview (Official Description): Ryuko Matoi is a vagrant school girl traveling from place to place searching for clues to the truth behind her father's death - the "woman with the scissor blade." The journey had led Ryuko to Honnouji Academy. Honnouji Academy - where an elite group of students is granted superhuman powers by their special uniforms called the "Goku Uniform." With the power of the uniform, the student body president, Satsuki Kiryuin rules the students with unquestioned power and fear. Satsuki holds the secret to the "scissor blade" and Ryuko confronts Satsuki to gain information but… Was their encounter a mere coincidence or fate? The clash between the two will soon consume the whole academy! Agenda: Discussed Katsucon. 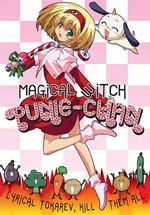 Monday will be pot luck - Magical girl episode round. Sam, the winner of game tournament has chosen to show Kill la Kill on Thursday. Overview (Description from Wikipedia): Jesus Christ and Gautama Buddha, the founders of Christianity and Buddhism, are living together as roommates in a Tokyo apartment while taking a vacation on Earth. 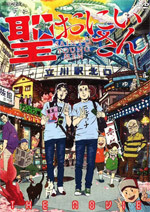 The comedy often involves jokes about Christianity, Buddhism, and all things related, as well as the main characters' attempts to hide their identities and understand modern society in Japan. 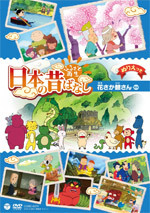 Each chapter shows how they go about or react to an average day, though they also go sightseeing or visit amusement parks. Agenda: Game Fest is scheduled for Saturday February 15th, 2014 in Kehr Union Multipurpose A&B from 10:00 a.m. - 5 p.m.
Overview (Official Description): A quartet of disaffected Korean youths have robbed a Seoul gas station. Later, while hanging out in a Chinese noodle shop, they decide to rob the same gas station. 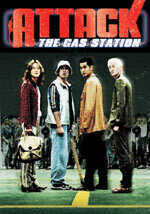 After taking the gas station over, their wacky antics ensue; forcing the manager to sing, kidnapping customers that complain about the service, and staging fist-fights between street gang members and gas station employees; all of these reflect their own gripes against society. Agenda: Game Fest is scheduled for Saturday February 15th, 2014 in Kehr Union Multipurpose A&B from 10:00 a.m. - 5 p.m. Sam has won the Penny Wars competition and was pied by a freshman representative. 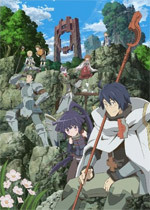 Overview (Description from Wikipedia): In the once suburb city of Zawame, a large company known as the Yggdrasill Corporation setting up shops in the whole city, it now feels like everyone is living in a castle town rather than a bustling city. To escape this feeling, young people throughout the city have formed dance crews called Beat Riders to bring joy back into their lives. Another rising popularity is the Lockseeds used in the Inves Games involving the conjury of creatures called Inves. 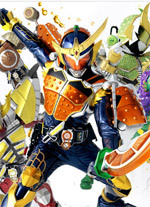 Kouta Kazuraba, a member of the dance group Team Gaim, is trying to find his place in the world, torn between his loyalty to his teammates and his sister's insistence that he find a real job. When Team Gaim's captain disappears after informing Kouta of a strange belt he found, Kouta discovers that the Lockseeds and Inves are actual items from an alternate dimension known as the Helheim Forest. When he is attacked by an Inves that enters the real world, Kouta uses the Sengoku Driver belt and the Orange Lockseed to transform into a samurai-armored warrior to destroy the Inves, and he discovers a mysterious girl who bears a striking resemblance to his close friend Mai Takatsukasa who warns him of his new fate in life as an Armored Rider. Overview (Official Description): Hana was a student before she was a mother. She was bright and pretty, and her future held endless possibilities. Then she met a man, who turned out to be a wolf, and together they built a family. Hana loved her mate fiercely, but fate took him from her, leaving her alone with two unusual kids she didn't know how to raise. 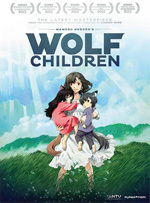 Frightened of being discovered, Hana and her wolf children fled to the countryside to build a new life. Raising her little wild things was an adventure. It left Hana bruised, scratched, exhausted, and joyously overwhelmed as her pups grew stronger and wandered further every day. This is a mother's journey. Teach your children to chase their dreams - and smile through the tears as they disappear into the world in search of who they will become. Hana wasn't always a mother, but it was always what she was meant to be. Show: Due to technical failure the meeting was declared void and does not count towards the anime shown. Agenda: Sam has won the officers Penny wars and will be pied at a later date. Game Fest is scheduled for Saturday February 15th, 2014 in Kehr Union Multipurpose A&B from 10:00 a.m. - 5 p.m. Discussed Setsucon. The club now uses a Twitter account. Dr. Long and Dr. Karsner stopped in to talk about the Japan Study Abroad Program offered via Temple University Japan Campus. An information meeting will be held on Thursday January 30th, 2014 from 5:30 p.m. – 6:30 p.m. in Old Science 113 for those interested. A new club constitution was revised during the meeting and successfully voted on. It will now be submitted to the CGA for approval. Overview (Official Description): Elder Tales has become a global phenomenon, immersing millions of players in its online fantasy world. However, something goes wrong with the twelfth expansion pack. Eight-year veteran Shiroe and 30,000 other players suddenly find themselves trapped in the game's no-longer-fictional universe! Except it's not even exactly the game they knew: things are in different places, the portals don't work, and if a gamer was playing an avatar who wasn't a physical match for their real self... well, let's just say that everyone who's been playing is going to have to make some serious adjustments to their new world view. Agenda: First regular meeting of the semester. Part of Monday’s meeting will be an information meeting to discuss the new constitution. Dr. Long and Dr. Karsner will be talking about the Japan study abroad program. Game Fest is scheduled for Saturday February 15th, 2014 in Kehr Union Multipurpose A&B from 10:00 a.m. - 5 p.m. See you at Setsucon on Saturday and Sunday!